“As a little girl, I was fascinated by trolls and fairies. And giants! I would run in meadows and forests and enjoy the presence of nature, the flowers and trees. I would draw the hairy trolls with their big ears and long tails, and fairy princesses. And when I grew up, I did not abandon them. They became my design friends and assistants and appeared in my work. If I couldn’t be in the nature all the time, I figured, at least I could wear nature all the time, even in the city! The fairies say they love to dress up in beautiful clothes to make their auras shine. I remember thinking of trolls once and then I heard them say: You must design us. I said that people might get frightened by them. But they insisted, until finally I made a knit with a long troll’s tail and people just loved it. The sunny meadows and mystical forests are present in my fashion today. “When I was 15 I announced I’d become a fashion designer. This decision took me to London, where I studied for 5 years. I visited fairy sites in Wales and Scotland and became fascinated by the Nordic mythology, Vikings and especially the Kalevala, the national epic of the Finns that inspired Tolkien and C.S. Lewis. I studied that and the ancient North legends and folklore and was hooked forever! When I returned to Finland, I worked in the fashion industry and soon established my company Bliss Design Knitwear. I first created the Finnish knitwear tradition, the Knitted Kalevala, and when that was ready, started to refine it. “When I started my feng shui studies, I had a strong vision of the future need for pure, sustainable fashion. This vision changed everything in my life and I established Mai Niemi Design House to focus on my mission. I created a conscious fashion concept I named IAMMAI and Mai’s Magic Wardrobe. They’re created with the cooperation and help from the nature world. That’s where the magic comes from. My patterns flung open to fly and move, the symbols became forms. The natural world opened up to me with flower fairies and dragons, which help me to choose colors (and fairies to combine them). The patterns I use are nature’s geometrical forms, and the symbolic language is a universal archetype language everyone understands and our bodies are familiar with and minds identify with. In this way I can bring nature even closer to the wearer. Diamond shapes, pentagons, stars, Flowers of Life, ankh, webs, florals, vivid colors and movements … all make design more alive. 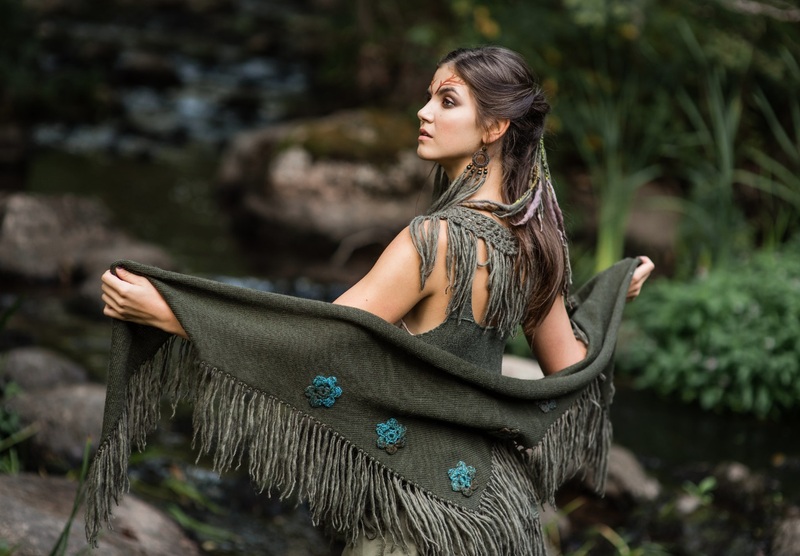 “In my designs I combine, arts, universal myths and archetypes, sacred feminine, matter and spirit, sacred geometry, feng shui, well being, roleplay, nature connection among other elements into holistic fashion. Mai´s Magic Wardrobe consists of basic simple knits and dresses and a variety of organic accessories to combine them with. All my garments are one size to fit most and are ageless and timeless and can be worn in all seasons and at all events. And to roleplay with and have fun and enhance creativity. The accessories–like collars, webs, and bracelets–act as small warmers and can be layered according to need and weather conditions. “We all need pinches of fantasy, of color, and of play in our everyday lives, but also quality practical functioning garments that are easy to wear and maintain. I mainly use wool as it is the most ecological material that doesn’t need to be washed often and is pure and micro plastic free and dissolves totally in nature. My ponchos are easy to fling on anything, they’re always the right way on and ”hands free,” plus they’re figure friendly and totally trendy and chic, and the best ever travelling companions. “I would like to say I only dress royalty, meaning that we are still the princesses and goddesses we remembered to be as little girls. No more Cinderellas, but fairy tale living princesses and queens, empowered modern and cosmic wonder women.